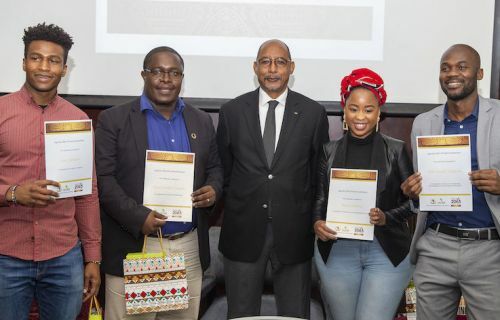 JOHANNESBURG – During an advocacy ceremony in Johannesburg, South Africa, the African Union Development Agency-NEPAD gave awards to five distinguished African Youth Champions for their contribution to Africa’s progress towards the goals of Agenda 2063. On this occasion, five young Africans who won ‘#TheAfricaWeWant Youth Essay Contest’ were also announced. On this special occasion, winners of the essay contest on #TheAfricaWeWant were awarded with prizes sponsored by the AUDA-NEPAD and Old Mutual South Africa. In first place was David Nyabenda from Burundi and the second prize winner was Mwanje Charles from Uganda. The third prize went to Fanto Foday from Sierra Leone, who was followed in fourth place by Bakani Mark Ncube from Zimbabwe. The fifth prize went to Grace Nakomolwa from Tanzania.